there is plenty of kissing going on!" 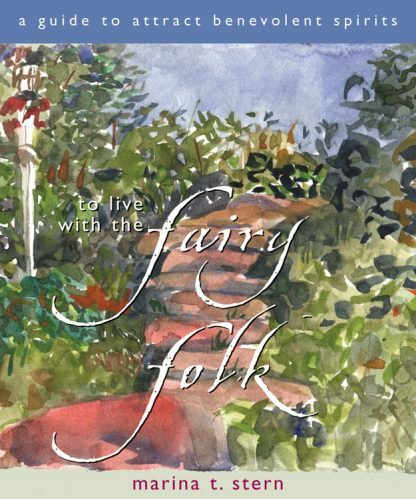 To Live with the Fairy Folk is a guide to changing one�s surroundings inside the house and in the garden to attract the elusive sprites seen frolicking and dancing in folklore of cultures as widely separated and diverse as Japan, Ireland, Spain, Denmark, and the Americas. "To be surrounded by cheerful Folk," writes Marina Stern, "is to be cheerful, buoyed up by the laughter of Nature Herself. To arrange your life, home, and especially garden in order to make the Folk welcome is to invite happiness, luck, and love." There are as many theories about the origins and identities of Fairy Folk as there are people who believe in them. They are known variously as "the Good People," "the Little People," "the Good Neighbors," "the Gentry," and "the People of Peace." The Folk are made of memory, imagination, tradition, and desire. They exist wherever people are � they are ever present, like air. To Live with the Fairy Folk teaches the etiquette favored by the Folks. Respect for privacy, generosity, neatness, fairness, and romance are essential. Then there�s the matter of where the Folk like to live � what trees to plant and how to best care for them, tips about lighting (inside and outside), and instructions for using water, shade, sunshine, and fragrances to make a Folk-friendly habitat. Stern concludes the book with magical garden designs you can easily duplicate.